You are here: Home » Movie Review: ‘Terminator Genisys’ – He’s Back! 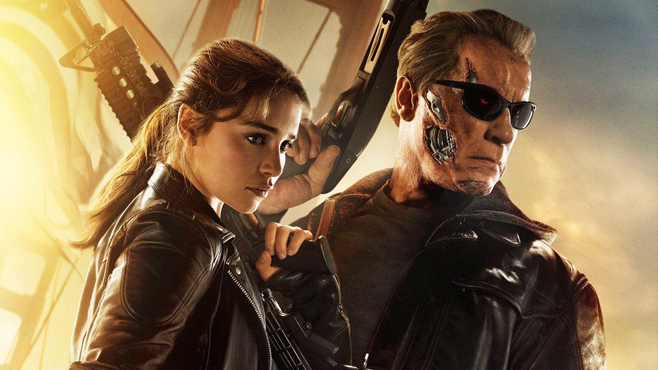 Movie Review: ‘Terminator Genisys’ – He’s Back! James Cameron’s The Terminator stormed the box office in 1984 with a story of time-travel, choice versus fate, and human heroes fighting against an implacable and unstoppable villain. Arnold Schwarzenegger, already popular from the Conan films, solidified his status as a bankable box office star. Linda Hamilton, and Michael Biehn, along with their characters of Sarah Connor and Kyle Reese, became pop-culture icons as the movie became a classic. The franchise spawned several sequels like Terminator 2: Judgment Day, Terminator 3: Rise of the Machines, and the disappointing Terminator Salvation, as well as the short-lived television series, The Sarah Connor Chronicles. John Connor, the messianic son of Sarah Connor, was introduced and came-of-age in these films. Fans of the franchise followed John’s struggles as he grows into the roles of a warrior and leader of the Human Resistance that eventually fights back against Skynet long after his mother has passed on. Skynet attempts to kill both Sarah and John multiple times over the years while the Terminator morphs from hunter to protector of both Connors in the course of the series. Terminator Genisys, the latest film in the franchise, released on last week and stars Arnold Schwarzenegger, Emilia Clarke, Jason Clarke, and Jai Courtney. The film also features supporting roles from J.K. Simmons, Matt Smith, and Courtney B. Vance. The film opens with a voice-over from Sergeant Kyle Reese (Courtney) explaining how most of humanity was wiped out when Skynet became active. A young Kyle is saved from certain death by an adult John Connor, leader of the Human Resistance. Kyle grows up to become John’s right-hand man, to whom he’s told nearly everything about his mother, Sarah. Kyle is clearly already in love with Sarah and is utterly devoted to John’s cause. The pair engage in dramatic assault on a Los Angeles base camp that hides a devastating weapon: a functioning time machine. The Resistance arrives only minutes after Skynet sends a T-800 (Schwarzenegger) into the past to kill Sarah Connor on May 12th, 1984. In the past, the T-800 encounters “the Guardian,” a T-800 sent back to protect Sarah Connor by an unknown party. The Guardian defeats the Terminator with Sarah’s help. In the future, Kyle volunteers to go back and protect Sarah to make sure John isn’t killed. But as Kyle is sent backward in time, John is attacked by a Terminator infiltrating the Resistance. Kyle arrives in the past and is saved from a T-1000 by Sarah herself, who is already a warrior in her own right and doesn’t need Kyle’s help. After a misunderstanding between Kyle and Guardian, whom Sarah affectionately refers to as “Pops,” Kyle learns that all of the information John gave him is no longer valid. Sarah reveals that the Guardian saved her from a T-800 when she was nine years old and has watched over her ever since. She also explains that she knows most of what’s supposed to happen, including that everyone who loves her ends up dead. The trio are attacked by the T-1000, who revives the T-800, but the trio is victorious. Kyle’s memories of an alternate timeline (in which his family is alive) lead to the heroes traveling to 2017, just days before Skynet is set to go online. They’re arrested by the cops only to be freed by John Connor himself, who is soon revealed to be a human-Terminator hybrid. John is now the enemy and is determined to help Skynet come online. This changes the entire direction of the series, and the man who was one humanity’s last hope is now the one bent on its destruction. Sarah and Kyle are rescued by Pops yet again, and flee to a new base with John in hot pursuit. Sarah, Kyle and the Guardian are soon forced to fight the last person they expected in order to save humanity from extinction. This movie is going to upset die-hard Terminator purists as well as anyone who cares about the exact science of time-travel. The visuals and the special effects are stunning, and every member of the cast is believable in their roles. Thirty years later, “Ahhnuld” is still spot on in his role as the machine with a heart of gold and his attempts at smiling are hilarious. Jason Clarke is a great John Connor-gone-wrong and I’m surprised that no one considered this kind of twist in the past. John has been the expected savior of the world that everyone’s been fighting to protect. Now Sarah and Kyle have to deal with the question of whether it’s right to purse their fated union knowing that their son no longer saves the world, but destroys it. Jai Courtney’s turn as Kyle Reese is different from Michael Biehn’s, but not in a bad way. Biehn’s Reese didn’t know that he would die or that he would go on to father John Connor, his leader and hero. Courtney’s Reese is shocked not only to learn that John is his son (and that he’s been manipulated by his hero/leader most of his life) but that he dies before ever getting to know him. He and Sarah struggle with the knowledge that their futures are seemingly written and that they now create the destroyer of the human race. But Courtney’s struggles further with being manipulated into loving a woman he would have loved anyway and that his son was the one who put him up to it. My greatest praise is reserved for Emilia Clarke. Fans of Game of Thrones already know that Clarke has acting chops, even if they’re tired of Danaerys being on the opposite end of the world from most of the big action. Sarah Connor, however, is at the center of the action from the moment she appears on-screen until the last scene. She’s not afraid to go toe-to-toe with the robots that want her dead, even when it turns out to be her own son. She even looked like a young Linda Hamilton while making the character her own. Hamilton brought Sarah Connor to life in 1984, but Clarke’s Connor won’t bow to fate’s whims, even as Guardian pushes her to simply “mate” with Reese and get underway with birthing John. Time-travel bugs me and this movie was no exception. Kyle is younger than John in the future, but appears to be the same age as Sarah in 1984. I’m not certain if this was the case in the original film. This movie also painted John Connor, originally shown as more honorable, with a darker, more self-centered brush. He saves Kyle as a young man and then manipulates his friend and “brother” into falling in love with his mother so that he’ll volunteer himself for a one-way trip to the past to make sure he’s born. John is also now the biggest weapon that Skynet has and is intent on seeing it enslave humanity instead of saving it. That may rankle some of the die-fans out there enough to give up the franchise. The Good: Excellent effects. Good story. Great Performances. Ahhnuld. Matt Smith as Genisys. The Bad: John Connor’s Inversion. Time-travel. The Verdict: A good summer action movie. Suspend your disbelief and check this one out. Did you watch Terminator Genisys this past long weekend? Share your thoughts about the Schwarzenegger flick with us in the comments below. “Old, but not obselete.” I actually enjoyed Genisys too. I thought my review was the only positive one out there ;) Great review! I thought the time travel elements were just complicated enough. I like the reset of familiar sequences a lot. Basically, we get a chase picture with multiple timelines and killer robots. I was also entertained between action scenes. To put it simply, Genisys was fun. You mentioned how Pops was sent back by someone. Who do you think sent him? Are the Terminators designed after a respectable figure who looks like Arnold? Did this person send the Guardian back in time? I watched the first three is this the newest one that came out?